This course is for lineworker apprentices. It introduces transmission and distribution systems. Students will learn about safety, climbing, overhead distribution systems, tools and service installation. This course is for lineworker apprentices. It introduces metering; rigging; pole work; care and testing of equipment; and distributing. Students will learn about safety, overhead maintenance, pole framing and guying. This course is for lineworker apprentices. It introduces line equipment, tree trimming, hydraulic derricks and digging equipment. Students will learn about DC fundamentals and pole top equipment and replacements. This course is for lineworker apprentices. It introduces line equipment, transformers, safety and distribution. Students will learn about underground hydraulic systems, AC fundamentals and hand tools. This course is for lineworker apprentices. It introduces compressors, transformer connections, underground conduit and street lighting systems. Students learn about distribution repair with gloves and hot sticks, and cable installations. This course is for lineworker apprentices. It introduces troubleshooting overhead and transformers, safety and power quality. Students will learn high-voltage AC power, switchgear and URD transformers. This course is for lineworker apprentices. It introduces reading electrical diagrams, transformers, safety and power quality. Students will learn about cable termination, troubleshooting, safety, and fault location. This course is for lineworker apprentices. It introduces voltage regulators, customer relations, cable fault locations and transformers, splicing and meters. Students will learn troubleshooting, circuit breakers, capacitors and reactors. You will need to be able to access the Internet on a regular basis to complete the online coursework and typical climbing gear for labs. Where do I go to attend labs? Everyone has a choice of two locations to attend labs. You can either attend labs at the Miller Campus Poleyard in Sandy, UT or the St. George Poleyard in St.George, UT. What books will I need to purchase for class? You will not need to purchase any books for class. All materials needed are provided online. Please refer to Registration below. What is the Drop/Withdrawal/Refund/Registration Policy? Students are required to pay for all classes that they do not officially drop. Full tuition will be refunded if student drops before the first day of class. Tuition will not be refunded if student is a “no show” for entire class. Last Date to Add Classes, Tuition Due Date will follow the Institutional Academic Calendar for the appropriate semester as Full Term 16-week schedule. How do I complete the Financial Responsibility Agreement Form? All apprentice courses at Salt Lake Community College are now open for registration. Registration for the Fall 2019 semester is due by August 16, classes start on August 21, and tuition is due no later than September 10. You will need to know the course title, course ID, CRN, and semester, which can be found below. The registration office will contact you when they receive your application to confirm your registration. Instructions to sign into the online classroom will be sent to you the week before classes begin and your instructor will contact you the first day of class. Also, each student will be required to sign a “Student Financial Responsibility Agreement” immediately upon registration. If you fail to do so prior to the first day of classes, you will be dropped. 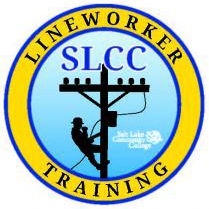 All Lineworker/Metering/Substation Apprentice Courses are now $782.00 to reflect increases to SLCC tuition since 2013. Graduation from the Lineworker Apprenticeship does not guarantee the ability to obtain a Utah state license to practice as a Lineworker. Licensure is the exclusive right and responsibility of each state. In order to practice as a Lineworker, students must satisfy individual state requirements, independent of SLCC graduation requirements. It is highly recommended that students consult in advance with the Intermountain Power Agency (IPA), or similar agencies in other states, to find out more about eligibility for licensure. For students who plan to work as a Lineworker in another state, here is one suggested website for researching state licensure requirements: License Finder sponsored by the U.S. Department of Labor.